Emperor Frederick II Hohenstaufen (1194-1250) took up where his father Henry VI had left off, hoping to consolidate his rule in Italy and Germany and to even expand as far as the Holy Land. He was in a constant struggle with the Church as well as with rivals and vassals, and to buttress his authority he constructed a vision of himself as a universal ruler. He took the Church’s claim to represent the entirety of humanity and created for himself a secular mission of a similar scale. As such, his ambitions far outstripped those of his father. He imagined himself as the heir to the ancient Roman emperors and looked to create an empire that encompass all of humanity. Depictions of human diversity became important for Frederick II, who surrounded himself with retainers and officials drawn from all over his empire and traveled ostentatiously with elaborately-dressed peoples and exotic animals in the style of a classical Roman triumph. 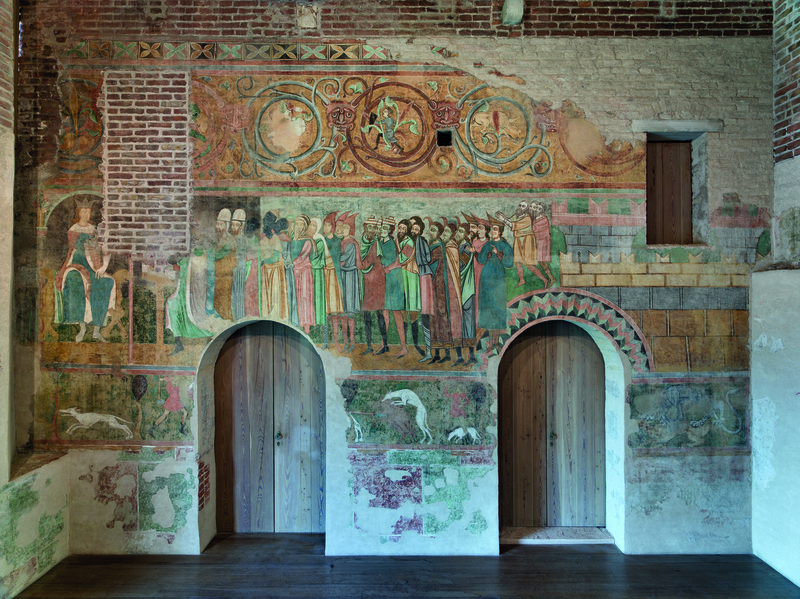 Frederick II’s universal pretensions are well illustrated in a fresco in Verona depicting him and his subjects. The painting includes a diverse range of physical appearances and fashions, and the individual figures’ features are detailed with care. The four Black men stand out because of their skin color, but no more so than the others’ facial hair and headwear distinguishes them. 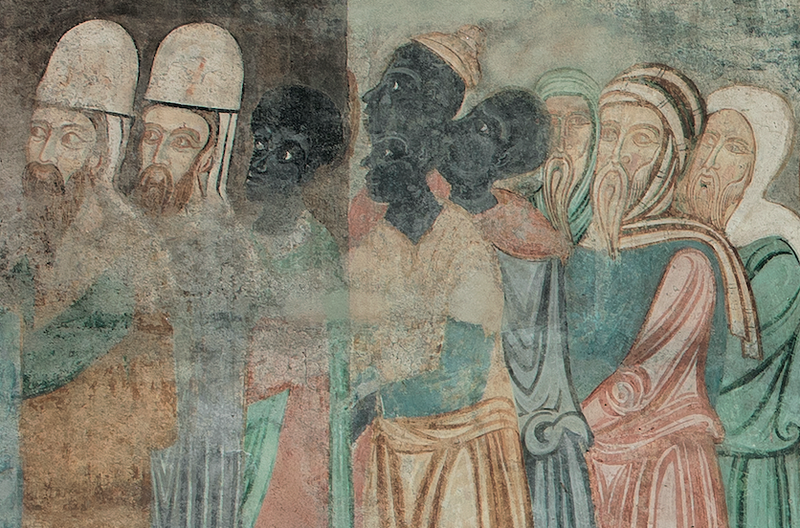 All of the figures represent important and valued components of a vast empire, and this iconography helps to explain the later appearance and spread of depictions of dark-skinned figures as saints and sacred figures. Source: Frederick II and His Imperial Subjects (ca. 1230s), Basilica San Zeno Maggiore, Verona. Emperor Frederick II rules over a cosmopolitan empire (ca. 1230s) by Jeff Bowersox is licensed under a Creative Commons Attribution-ShareAlike 4.0 International License.